Tis the soon-to-be-season for cranky, crackly dry skin. Sure, this fall weather still feels more like summer, but it's never too early to start prepping a quick escape plan for your skin once the temp drops. During the warmer months, most of us (especially down south) have our facial skin care game on point: moisturizers with SPF in constant slather to save us from the sun; humid weather doesn't make it hard for our skin to retain that moisture. But the moisture leaves, temperature drops, and all hell breaks loose on that pocket book while we scramble for new face saving products. In our new series, Save Face, we'll explore the various methods of avoiding said dermal drama this season by using simple, nourishing, natural ingredients. Granted if you're reading this, DIY face care probably sounds more #basic than groundbreaking. But hear me out. The reason why throwing together your own ingredients is often better than letting the drugstore do it for you, is because you can completely tailor your treatment to fix whatever complexion complications yr dealing with. Plus who can argue with ideas like sustainability, consumer awareness, herbalism... anyway, off the soapbox and on to happy skin! Cold, aired weather and artificial heat can easily dry out our skin. The dryer your skin gets, the more likely you can expect irritation, inflammation, and even an uptick in breakouts. As your skin becomes dehydrated, your oil glands actually begin to work in overdrive, hoping to compensate for what's missing. Excessive oil + dehydration can = a breeding ground for bacteria and new blemishes. 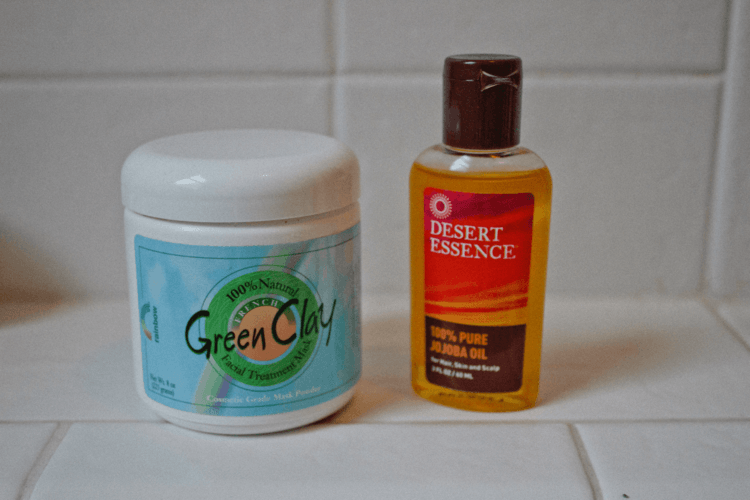 In hopes of combating these blemishes, we often use harsh products that attempt to remove this excess oil by only further dehydrating our skin. During colder months, this routine can end in a deadly vortex of tight, thirsty, and flaky skin. By deadly, I mean deadly. 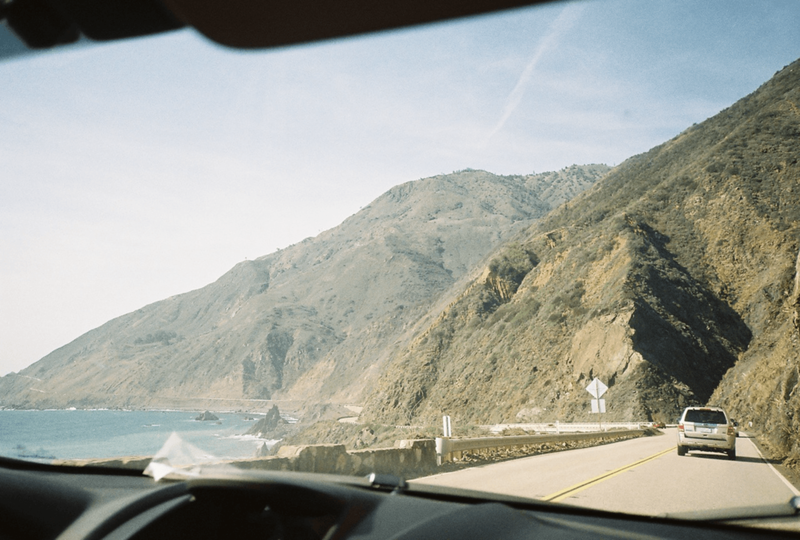 The final chapter for our flaky and dry skin is just that. Without proper exfoliation these dead skin cells will continue to camp out, causing our complexion to look dull and delay new cells from regenerating. The takeaway? In laymen's terms: hydration, gentile protection, and exfoliation. While there's a slew of amazing products that meet these needs and more (insert dermatologist recommendations here), we shouldn't overlook the many benefits of common, natural ingredients often hanging out in the cupboard. Today we'll be justa touchin the surface of homemade face care with a few pain-free healing mask. Depending on where your woes are in the previously discussed spectrum of cold weather culprits, one recipe might be more appropriate than the other. For those so blessed with blemish-prone skin (hi me), these masks work specifically to help alleviate any unforeseen breakouts. Jojoba oil is an extract of the jojoba tree seed - not technically an oil, but rather a wax ester. Why it matters? Because this wax ester is the closest natural compound to human skin sebum. Why that matters? Because when applied, jojoba oil might actually have the juju to trick our skin into thinking its oil production is in balance. Remember when we talked about how dry skin can actually cause our oil glands to overcompensate in production? More oil = more breakouts. Well using jojoba oil not only hydrates your skin but can also maintain oil production stability. Jojoba oil is also anti-inflammatory and anti-microbial, which can help reduce redness from acne or eczema, but equally gentle to calm the surface. By now if yr unaware of the brain melting benefits of thou holy coconut oil then you either hate the internet or live in isolation. But just incase those never-ending benefits are but a blur of health-boosting adjectives or Refinery29 posts, let us recap its many external benefits: Coconut oil is composed primarily (almost 90%) of saturated fats, that when applied to our skin these fats help retain its moisture content by preventing loss through our pores. Coconut oil also contains vitamin E, about 0.1mg in every 100g, which is an antioxidant, anti-inflammatory, and contributes to healthy skin regrowth and tissue repair. Coconut oil is also packed with proteins that too contribute to skin cell repair and new growth. Last, and maybe its most promising benefit towards treating breakouts, is that coconut oil contains specific fatty acids, Capric, Caprylic, and Lauric acid, that act as strong antimicrobials and antibacterials which can cleanse the skin and penetrate pores to prevent future blemishes, as well as combat aging skin and macular degeneration. Last is our lemongrass extract, and here a lil' bit goes a long way. Lemongrass is packed with an obnoxious amount of health benefits, just a few include: analgesic, antidepressant, antimicrobial and antibacterial, antiseptic, nervine, fungicidal, sedative, and a reliable health tonic. Lemongrass can cleanse the facial surface of bacteria, but also work to relax the skin, and historically its been used to relieve muscle and joint aches. It's sweet, fresh scent has been linked to relieve symptoms of stress, headaches, and nervousness - as lemongrass specifically can help boost the nervous system generally through stimulation. I chose to purchase my essential oil from our health food store, being sure that it was properly distilled as to not miss any healing benefits. Depending on sensitivity, lemongrass can be harsh if applied directly to skin. However with out mask we'll only be using a handful of drops amongst much more carrier oils. Mix all ingredients together and massage into skin, covering your entire face. Leave on for 10 to 15 minutes and then remove with tissue. It is not necessary to rinse off mask. Depending on your use, you can lessen the ingredient amounts by half or more, to then apply thinly and leave on as a moisturizer. All hail the healing powers of green clay, or as some may know it sea clay, for this mineral skin clay contains a plethora of beneficial elements and oxids that include magnesium, calcium, potassium, dolomite, silica, phosphorus, and selenium. Green clay is made of 100% bio-organic material, collected from curative volcanic ash more than 100 ft. below the earth's surface. Green clay is in fact green because of its formation: decomposed plant matter and iron oxides. 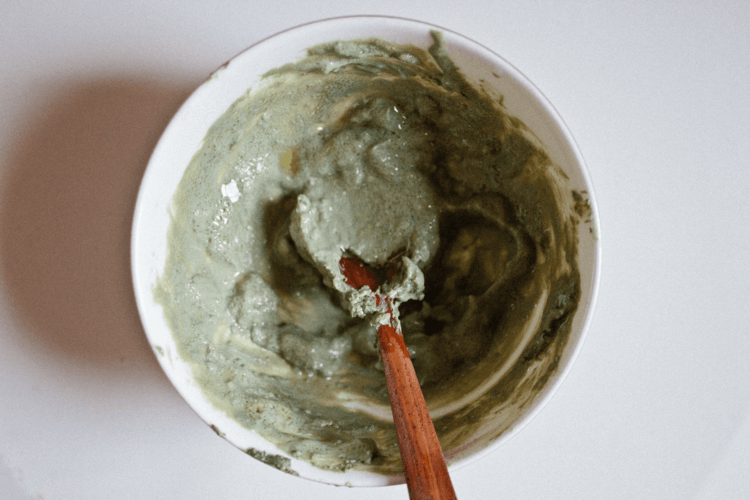 Powers combined, the green clay acts as one of the most detoxifying agents in nature due to its high absorption capacity, literally pulling the toxins and impurities away from skin tissue. The absorbing action also works to stimulation fresh blood beneath the skin, revitalizing a dull complexion from damaged or dead skin cells. Using a green clay mask during winter seasons can be helpful to repair UV damage for summer. It is also incredibly effective in treating acne blemishes and brightening skin through circulation, working to speed up the skin cell regeneration, necessary when suffering from dull or flaky skin. However, green clay can be extremely drying. If you already suffer from dry skin, only intensified because of seasonal change, it is best to mix an oil, such as jojoba or aloe vera, with your mask. Because green clay is circulatory, when removed your face may appear red but not necessarily due to irritation. If you are using this mask on especially acne-prone or blemished skin, it is best to maintain a weekly routine of use as it's pulling or absorbing abilities may cause spots to appear more visible during first application. Mix all ingredients together and massage into skin, covering entire face. Depending on mask thickness, leave on for as little as 10 minutes or as many as 30. Do not let mask fully dry or harden. Simply removed with warm water. Be sure to apply a moisturizer directly after. We've long proclaimed our permanent crush on raw honey all over this dang site, and rightly so. Raw, organic honey can be a righteous skin savior, acting to fight blemishes, restore moisture, brighten, and exfoliate. Raw and unprocessed honey is naturally anti-bacterial and anti-inflammatory, which works to battle and prevent acne, rosacea, or eczema flare-ups - all easily trigged by cold, windy weather and central heating. Honey's antioxidant and anti-microbial abilities work to protect skin from future seasonal damage, encouraging cell rejuvenation. Part of this rejuvenation process is honey's abilities as an exfoliant: sugars glucose and fructose, natural alpha-hydroxy acids, that actually dissolve dry skin cells. Hygroscopic by nature, honey naturally absorbs and retains moisture when exposed to air keeping skin hydrated and fresh while preventing dryness. When applied, a small amount of honey will seep into pores, continuing to attract moisture even after the application has been removed. Honey can also help our skin maintain its natural pH level, while still providing added nutrients like vitamin B, potassium, and calcium. Also high in antioxidants, honey works to eliminate free radicals and supply nutrients for new tissue growth. Using honey during winter can not only be an incredible moisturizing tool, but also work to repair sun damage from the summer. It is imperative that you spend those extra $10 bucks on raw, unprocessed, organic honey. Almost all commercially made honey has lost the bulk of its nutrients and healing properties due to exposure to high heat and processing. Furthering our exfoliation mission we move onto the ever-festive, cinnamon. By texture, cinnamon provides a less harsh exfoliation, as opposed to the hard grit of sugar. Applied topically (and of course internally, but within reason) this spice has shown to increase the production of collagen on skin through its main chemical component cinnamaldehyde, working up to six hours after application. Interestingly enough, many moisturizers tout collagen as an ingredient, yet no OTC products penetrate skin deep enough to effect collagen production. 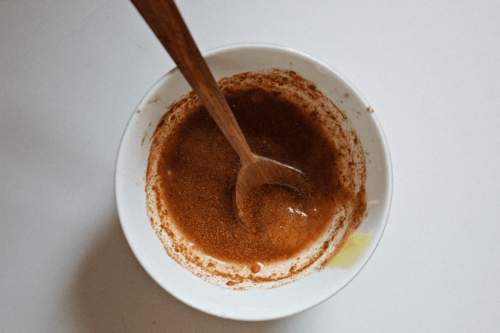 You may also experience a 'plumping' effect when topically applying cinnamon, for it encourages blood circulation through stimulating blood vessels. Better blood circulation = less inflammation. Whether suffering from inflammation because of cold weather winds or blemish flare-ups, cinnamon's antioxidants and anti-microbial properties may effectively aid in treating acne and eczema. Lemon juice is full of healthy vitamins such as vitamin C, as well as antioxidants such as citric acid which exfoliate dead skin. Lemon's citric acid can also act a natural skin brightening agent, working to diminish discoloration and even skin tone. Naturally anti-bacterial and an antiseptic, fresh lemon juice can help clean dirt and bacteria from skin, particularly oily skin. But beware, if using this mask with any open wounds it may be best to omit the lemon. 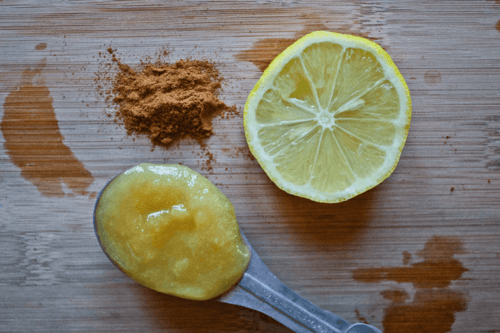 Thoroughly mix honey, cinnamon, and lemon to a fine consistency. Omit warm water if happy with thickness. Evenly massage into face for up to minute working to exfoliate. Let mask sit for another 15 minutes or so. If the cinnamon begins to tingle to the point of pain, simply wash off with warm water.